NEW YORK -- Emotionally wrenching politics, foreign conflicts and shootings at home took a toll on Americans in 2016, but they are entering 2017 on an optimistic note, according to a new poll that found that a majority believes things are going to get better for the country next year. Here’s a look at the key findings of the Associated Press-Times Square Alliance poll. Americans weren’t thrilled with the year. Only 18 percent said things for the country got better, 33 percent said things got worse, and 47 percent said it was unchanged from 2015. Fifty-five percent said they believe things will be better for them in the coming year than in the year that just concluded. That’s a 12-point improvement from last year’s poll. Americans interviewed about the poll’s results expressed some of that optimism. “Next year will be better than this year, because people will have more jobs and they’ll have more money to spend,” said Bourema Tamboura, a Harlem resident behind the wheel of a New York car service. Democrats are more likely than Republicans to say 2016 was worse for the country than 2015. And Republicans are especially likely to feel that 2017 will be even better for them personally. Robert Greenstone, a New York commercial real estate broker, said the political discourse leading up to Republican Donald Trump’s election as president played havoc with people’s emotions. “The amount of disinformation made people suspect of everything and everyone, even their neighbors,” he said. The U.S. elections top Americans’ list of 10 top news events in 2016. Three-quarters called the presidential election and Trump’s victory very or extremely important. Sixty-three percent ranked mass shootings and bombings in Orlando, Florida, and in Belgium, Turkey, Pakistan and France as personally important news stories of the year. Fifty-one percent said they found news stories about the deaths of people at the hands of police officers, or news about ambush attacks on police in three states, to be among the year’s most important news events. Fourth on the list are 43 percent who described the spread of the Zika virus as important. The three events described by the largest percentages of Americans as not too important included the death of Muhammad Ali (50 percent), approval of recreational marijuana use in four states (43 percent), and the death of Fidel Castro (40 percent). A majority of Americans, including 7 in 10 Midwesterners, called November’s World Series win for the Chicago Cubs to end their 108-year drought memorable. Of nine other pop-culture items tested, two were called memorable by about half of Americans: the death of Prince, David Bowieand Leonard Cohen; and the Olympic victories of the U.S. women’s gymnastics team. The two least-notable events for Americans, of the 10 possible choices in the poll, were the Angelina Jolie-Brad Pitt divorce filing and the “Pokemon Go” app game phenomenon, each described by most as forgettable. About half of Americans plan to celebrate the New Year at home. About 2 in 10 plan to go out to a friend or family member’s home, and 1 in 10 to a bar or restaurant. About a quarter don’t plan to celebrate at all. 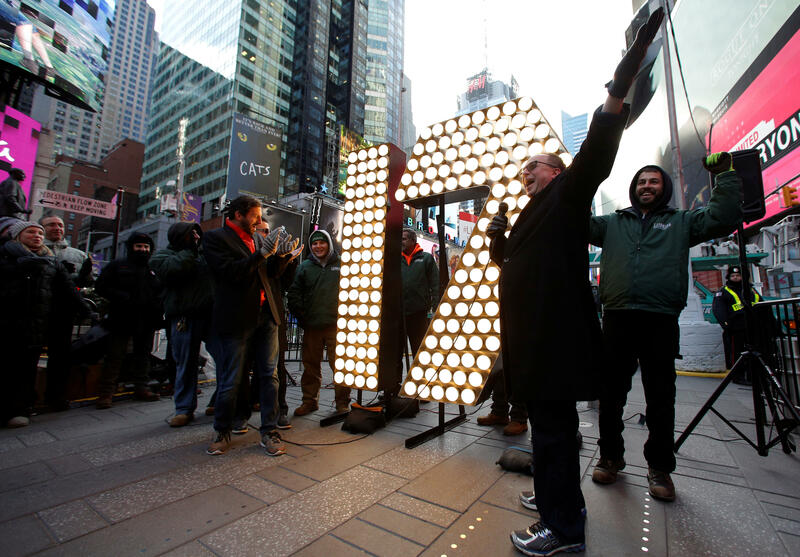 About 6 in 10 plan to watch the Times Square ball drop, nearly all of whom will watch on TV. The AP-Times Square Alliance Poll of 1,007 adults was conducted online Dec. 9-11, using a sample drawn from GfK’s probability-based KnowledgePanel, which is designed to be representative of the U.S. population. The margin of sampling error for all respondents is plus or minus 3 percentage points.